Born in 1933. After graduating from Tokyo University Law School in 1956�Aentered the Ministry of Home Affairs. 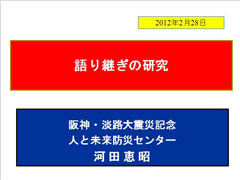 In 1970, Became the regional manager of Hyogo Prefecture General Affairs Department, and Leitenant Govenor since 1980. Was inaugurated as Hyogo Prefecture Govenor in November, 1986�Aand served 4 terms, over 15 years.. During his 3rd term, on January 17, 1995, the Great Hanshin Awaji Earthquake occured, and he lead the recovery. Currently, along with his present position, he also serves as the chairman of for the Hyogo regional policy research organziation, and on the eduction council, etc. 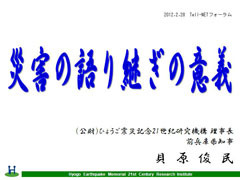 His published workes include "100 days Record of the Great Earthquake Disaster--the Diary of Hyogo Prefecture Govenor" (Gyosei) and "Warnings from the Earth--What was the Message of the Great Earthquake?" (Gyosei), "The Great Hanshin-Awaji Earthquake--15 years Record of the Hyogo Prefectural Govenor" (Maruzen). �@Prof. Kawata graduated from Department of Civil Engineering, Kyoto University in 1969, and obtained PhD in 1976 from Kyoto University. He was Associate Professor in 1976, Research Fellow, University of Washington in 1981-82, Fulbright Senior Research Fellow at Princeton University in 1992 and got the full professor position in 1993. 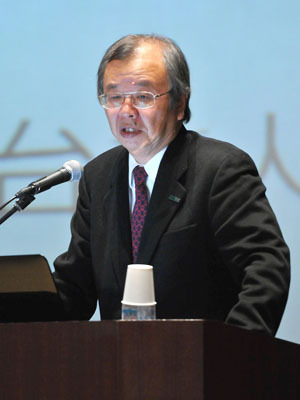 He was Director of DPRI, Kyoto University in 2005 to 2007. 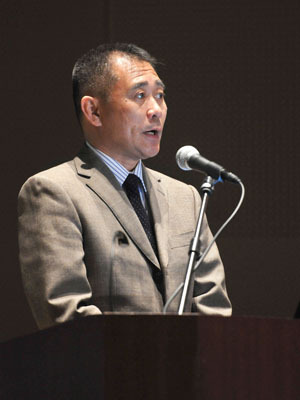 In 2002, he became the founding Director of the new institute established by central and Hyogo Prefecture government to memorialize the Kobe earthquake, the Disaster Reduction and Human Renovation Institution (DRI). 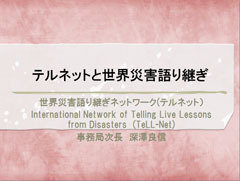 He published more than 623 technical papers and 43 books in the fields of integrated disaster reduction systems of catastrophic disasters including urban disasters and their emergency management. 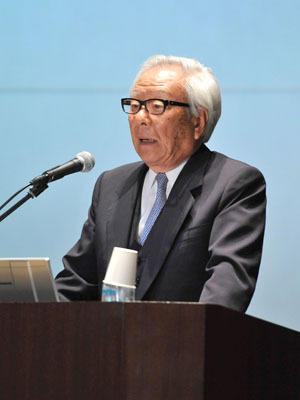 He was President of Japan Society for Natural Disaster Science, Vice Presidents of Japan Society of Disaster Information and also Natural Hazard Society. 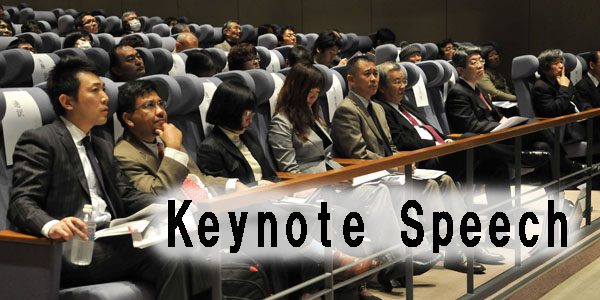 He received the 1993 Japan Society of Civil Engineers Award and the 1994 Japan Society for Natural Disaster Science Award. He was a laureate for 2007 United Nation Sasakawa Award for Disaster Reduction and a recipient, 2009 Distinguished Services Commendation in the field of disaster management, awarded by the Prime Minister. �@Educational backgroun in Civil Engineery and Public Engineering, (Masters).? In 1082 entered the Japanese National Land Agency; mainly focusing on regional land use planning and the adoption of disaster prevention measures�Gworked for UN Habitat (Nairobi); UN OCHA (Geneva); DRI . Since 2008, worked for the Ministry of Internal Affairs and Communitcation, Fire and Disaster Management Agency, and Councelor of the Disaster Prevention Agency.